The United States Army is exactly what Hawkeye signed up for. Captain Benjamin Franklin Pierce. Hawkeye is his nickname from the book his father Daniel Pierce loved so much: "The Last Of The Mohicans." 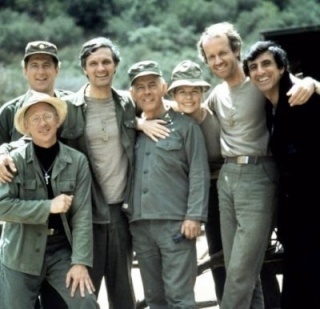 Hawkeye had just settled down in Korea and he did what any American would do in a foreign country: Look around and get used to his surroundings. While doing that, he came across a fellow Army surgeon, Major Margaret Houlihan. Boy did she grab his attention quickly. He was a ladies man, that's a proven fact and for some reason he really wanted to talk to Margaret. "Well hello there, Major, may I call u Major? Unless u prefer something else." he said. 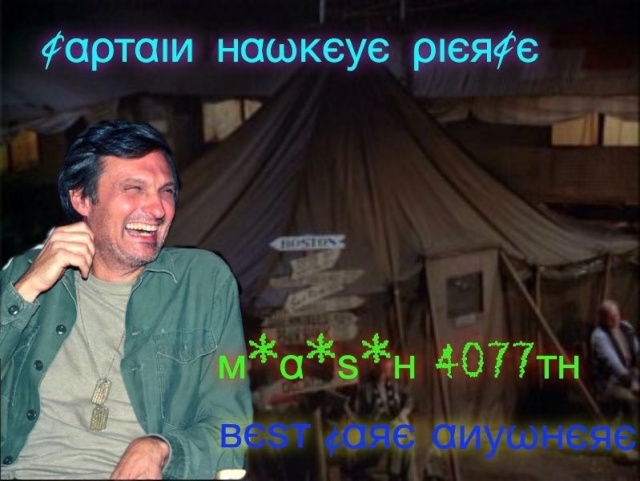 As they were walking towards the mess tent, Hawkeye looked at Margaret and smiled. "Well, I got here about 25 minutes ago. Looks like u and I are the first ones here. Aren't we the lucky ones? What do u say we go into the mess tent and see what we can find to eat? Although. I'm pretty sure it's crappy military food. Oh would I kill for a nice plate of Adam's Ribs and coleslaw. What about u? When did u get here?" he asked. Well, I got her about half an hour ago...I guess I can unpack the rest later.... she smiles...thank you for the warm welcome:) She giggles. Food sounds like a great Idea. I hear a huge truck load of BBQ Chicken is bound to get here already maranated...ooo I can smell it now...and ceasar salad Sure! Lets . She gets in and she sees beer and wine and coffee and apple juice and the tables are being prepared. Hawkeye blushed. "Ohhhh, so u did beat me here. Interesting. I thought I would be the first one here. Guess I was wrong. Just kidding. You'll have to excuse my sense of humor. Anyways....wait.....do u hear that? Choppers. Dammit. I've only been here 30 minutes and they're already putting me to work. Shame on them. Come on, Margaret, let's prep for surgery. I guess I forgot to tell u I'm a surgeon." he said. Hawkeye scrubbed his hands and put a mask and cap on. "Looks like we have a gunshot wound to the knee. Judging by the damage, I'd say he tore some cartilage. He'll probably lose his leg." he said. Hawkeye looked up from what he was doing. "Listen pal, if u have a problem, we can take this outside. Otherwise, we have a patient to take care of." he said. He looks...fine... As they head in and start scrubbing in and start helping with the surgery...Yep...they chipped the bone. "Margaret, no. I need u to assist me in O.R. We can fix the beds later. If we don't get into surgery now, there's a good chance this kid will die." Hawkeye said. She nods coming into O.R. With him. She eyes the patient and gets ready masking herself to prep in surgery getting scrubbed and gloves on...and she gets the patient to calm down. Hawkeye looked at Margaret. "That right there is Frank Burns. Thinks he's the best surgeon in Korea. I'm about to prove him wrong." he said. "Dammit Margaret there's no time for coffee." Hawkeye said. I know that! as she puts it down and gets washed and puts her mask on and puts her gloves on and gets ready to do surgery. Potter: WHAT IS GOING ON...? IS all in order in here??? he looks. Margaret: yes it is....we are fine....as she puts the tube in to clean the area she is preparing to work on. She gets her scalpol. She hands Hawkeye his and gets ready to work. Potter: Ok Margaret...watch out...good...ok insert SLOWLY... Margaret does as Potter drops the tube and She makes the move to fix it and does it. The machine goes nuts...the doctors argue. MARAGARET : SHUT THE HECK UP! we cannot think! as she works.... Potter: OUT MARGARET OUT! Margaret snarls leaving. she growls.... heading back to the tent. ever since she arrived Potter had it out for her. Constantly. She gets her bag and starts to pack...maybe this was a horrible mistake. What does Hawkeye say to that? she gets her bags zipped and she gets ready to call for a plane out. Hawkeye looked at Margaret. "As Chief Surgeon of the unit, I think u need to step out for a bit. U come back when u get your head on straight, Margaret." he said. her eyes go big.... She sits and the night is long....the next morning she is in tears... as Potter has her get in the jeep to leave base. He loads up her things and booked her plane ticket....and she sighs... I guess ...the army isn't for me? as the jeep is getting gassed and Col. Potter has it set and ready to have a soldier drive them out. What will happen? She has her hands on her cheeks... her tears are evident. Hawkeye snapped his gloves off and went after Margaret. "Wait a minute. I meant for u to leave the operating room. Not Korea, Margaret." he said. Potter: Well I initiated that part!! as She sees the look on Hawkeye's face and Hawkeye is ready to take a bird. What kind I do not know but yeah...he is not happy and to him...it was not over. Hawkeye looked at Margaret. "I'm Chief Surgeon and I decide who goes where. I know he outranks me, but in the OR, I outrank him and right now I want u to take the rest of the night off." he said. She looks... Okay.. as she gets her gloves off and she gets her doc Coat on and heads to the Tent.... I do my best! Am I ready for Korea? Hawkeye nodded. "Yes, Margaret, u are ready for Korea. Now just go and take it easy. I'll stop by after my shift." he said. She looks nodding...and gives him her punch card...and smiles a little... wiping her eyes and heads back to her tent...she cooks something and eats it and lays back... her tea on the coffee table. She sighs... She wants to be the best doctor there is. Hawkeye watches as Margaret goes to her tent. "That was difficult." he said.